Find the perfect things to do in Houston this weekend with our Houston Weekend Guide for Thursday, April 12 to Sunday, April 15, 2018. Eat your weight in barbecue, discover and celebrate Japanese traditions, create your own vision board, watch a free, outdoor concert, see the Disney princesses perform on ice, watch decorative art cars parade through the city, and more. Check below to find great things happening around Houston this weekend, from Thursday, April 12 to Sunday, April 15, 2018. Cleo at Alley Theatre | Daily – Enter the scandalous disaster that was the filming of the 1963 film, Cleopatra, starring Elizabeth Taylor and Richard Burton. Directed by Bob Balaban, this live performance reveals the dramatic, real-life romance that launched the age of paparazzi and tabloid celebrity. Showtimes vary. The Escape Game Houston at CityCentre | Daily – Newly opened this week, the Escape Game Houston entertains and delights as it puzzles its players. Four distinct 60-minute games and experiences offer you the chance to be an art thief (or catch one), find a prospector’s hidden gold, break out of prison, or get out of a 5th grade classroom early on the last day of school. Click here to reserve your game time, book online or learn more. $31.99 per person, but you can save $5 per person with promocode “Houston365” on games played from now through Tuesday, May 15, 2018. 7am to midnight daily. 7am to midnight daily. Disney on Ice: Dare to Dream at NRG Stadium | Daily – Treat your kids to an exciting show performed by their favorite Disney princesses, including Moana, Elsa, Belle, Cinderella, and more. Tickets start at $20, but you may find cheaper or better seats on TicketNetwork’s resale marketplace. Showtimes vary. Eighth Day of the Week at Ensemble Theatre | Daily – Follow the struggles, discoveries, and coping mechanisms of an African American family whose mother suffers from Alzheimer’s disease. Through raw emotion injected with humor, this play aims to raise awareness of a disease that affects families around the world. Tickets start at $30. Showtimes vary. Cabaret at Obsidian Theatre | Thursday to Saturday – Travel back to 1930s Berlin at the Kit Kat Club, where the Emcee’s bawdy songs and wry commentary allow its guests to forget the looming darkness arising throughout the country. Enjoy a night of Tony Award-winning music, impressive sets, and a spellbinding story in Cabaret. Tickets are $40, but you may find limited discounted tickets for $20. 8pm. Opening Weekend of The Cottonmouth Club in Downtown | No Cover | Starts Friday – The highly anticipated, come-one-come-all bar opens on Main Street in Downtown, serving up world-class cocktails and private barrel blended whiskey. 4pm to 2am daily. International Gem & Jewelry Show at NRG Park | Friday to Sunday – Admire a dazzling collection of gemstones, fine jewelry, engagement rings and bands, designer watches, pearls, beads, accessories, and minerals during the International Gem & Jewelry Show at NRG Park. Tickets are $6, but limited comped (you just pay the ticketing fee) and discount tickets are available. Times vary. Don Quixote at the Hobby Center for the Performing Arts | Friday to Sunday – Sit back and enjoy the Houston Ballet’s dazzling performance of Don Quixote, a jovial tale based on the Spanish novel by Miguel de Cervantes Saavedra. Produced by Ben Stevenson, the ballet features impressive choreography, decorative costumes, and spellbinding music. Tickets start at $39. Showtimes vary. The Catastrophic Theatre presents Small Ball at MATCH | Friday to Sunday – Pique your interests of both sports and musical theater with The Catastrophic Theater’s performance of Small Ball at MATCH. Commissioned by Houston Rockets general manager Daryl Morey, Small Ball follows a group of Lilliputians who form a FIBA basketball team in hopes of gaining international recognition. Tickets start at $10. Showtimes vary. Houston Astros vs. Texas Rangers at Minute Maid Park | Friday to Sunday – Get loud for the Astros when they take the field to play the Rangers in a home game at Minute Maid Park. Tickets start at $20, but you may find cheaper or better seats on TicketNetwork’s resale site. Times vary. Daisy at Main Street Theater | Friday to Sunday – Take a seat for Main Street Theater’s newest production, Daisy, a play inspired by the infamous advertisement from the 1960s. Based on real people and events, Daisy explores the impact of the media and that unforgettable commercial now known as the origin of negative ad campaigns. Tickets start at $36. Showtimes vary. 25th Annual Japan Festival Houston at Hermann Park | FREE | Saturday and Sunday – Celebrate the rich heritage of Japan with traditional and contemporary music, dance, food, and activities at the 25th Annual Japan Festival in Hermann Park. During the festival, you can learn about a variety of Japanese traditions, including Ikebana flower arrangement, tea ceremonies, origami, shodo calligraphy, bonsai and more. Times vary. The Buzz Weekday Workout at Evelyn’s Park | FREE – Work up a sweat with The Buzz Magazine and Pledge To Fitness trainers at Evelyn’s Park Conservancy. The class consists of a 15-minute warm up, 15 minutes of stretching, a 25-minute targeted workout, and a 5-minute cooldown. 8:30am. Siempre Selena Tribute at Proof Rooftop Lounge | No Cover – Pay homage to the beloved Tejano pop star with a special tribute at Proof Rooftop Lounge. You’ll hear from bands such as Los Skarnales, Grupo Negami, David Olivares, and Kaos. 6pm. Dancing with The Woodlands Stars at The Woodlands Waterway Marriott Hotel and Convention Center – Cheer on members of The Woodlands community as volunteers hit the dance floor to compete for votes and raise funds for The Woodlands Family YMCA. Along with live dance entertainment, guests will enjoy a buffet dinner, cash bar, art sale, and silent and live auctions. Tickets start at $150. 6pm to 9pm. Thursday Night Take Over at Fluff Bake Bar | No Cover – Join Fluff Bake Bar owner Rebecca Masson as she welcomes fellow chef Justin Brunson of Denver’s Old Major for this week’s Thursday Night Take Over. Each chef will prepare a menu of three to four items available a la carte, along with optional wine pairings and beer from Saint Arnold. 6pm to 9pm. Art Car Sneak Peek at Discovery Green | FREE – Catch a glimpse of the creative cars before they parade through Downtown with Discovery Green’s Art Car Sneak Peek. They’ll have live music, food, drinks, and outdoor fun. 6pm to10pm. The Life Aquatic with Steve Zissou Movie Screening at Market Square Park | FREE – Grab your lawn chairs and head to Market Square Park for a free screening of The Life Aquatic with Steve Zissou. The film follows a motley crew led by an oceanographer who seeks revenge on a mythical shark that killed his partner. 8pm. The Government Inspector at Chelsea Market – Take a seat for Classical Theatre Company’s performance of The Government Inspector, which tells of a corrupt, small-town mayor who learns that an incognito inspector is heading to town for an anonymous inspection. $25. 8pm. Zumba at Sugar Land Town Square | FREE – Sweat it out while dancing to upbeat, Latin music during this free Zumba class by Cida Fitness at Sugar Land Town Square. 10am to 11am. Beers & Art at Saint Arnold Brewing Co. – Drink local craft beers while viewing the work of talented Houston artists and vendors during Beers & Art at Saint Arnold Brewing Co. You can also shop vintage finds from local curators and enjoy live music throughout the evening. 5pm to 10pm. Backyard Jam Concert Series at Market Square Park | FREE – Kick off the seasonal Backyard Jam Concert Series at Market Square Park with a free outdoor concert from local acts Dollie Barnes and Vodi. 7pm. 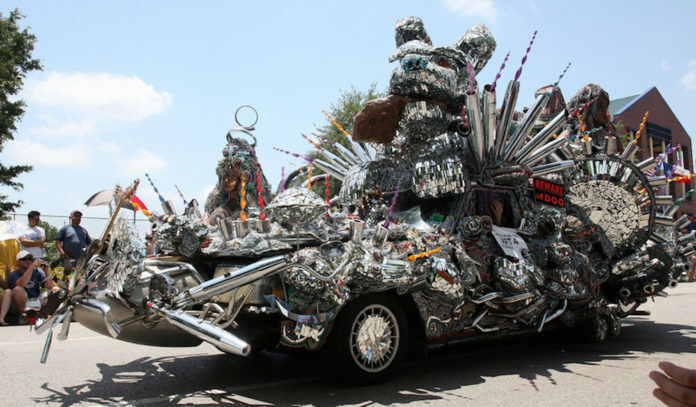 The Legendary Art Car Ball at Hermann Park – Ring in Art Car weekend with live music, flaming baton twirlers, and a costume pageant at The Legendary Art Car Ball. Along with food and drinks, the ball will feature performances from Golden Dawn Arkestra, Free Rads Street Band, DJ Fredster, and Ms. Yet and The Renegade Carnies with MDSO. $30. 7pm. The James Hunter Six in Concert at The Heights Theater – Catch a performance from the English R&B musician and soul singer, James Hunter, and his band at The Heights Theatre. Jolie & the Jackalopes open the show. Tickets start at $22. 7pm. Rienzi Reels: The Thomas Crown Affair Movie Screening – Enjoy an outdoor film screening of The Thomas Crown Affair (1968) amid the beautiful Camellia Gardens at Rienzi presented by the Museum of Fine Arts, Houston (MFAH). Tickets are $15 for nonmembers and $12 for members. 7pm to 9pm. Broadway at the Box at The Music Box Theater – Experience a night of musical theater as performers The Great White Way return to The Music Box Theater. See Broadway classics from decades past, as well as popular newcomers. Tickets are $29, but you may find limited discounted tickets for $14.50. 7:30pm. ComedySportz Match Improv Show at CSz Arena – Crack up as you participate in this interactive improv show from ComedySportz. Tickets are $20, but you may find limited discounted tickets for $14. 8pm. Brilliant presents Vanessa Williams’ Let Freedom Ring Concert at The Corinthian – The Superstar singer, actress, dancer, and author takes the stage for one night only to present a soul-stirring concert celebrating the life and legacy of Dr. Martin Luther King, Jr. Tickets range from $49 to $74, and limited discounted tickets start at $32. 8pm. Marco Antonio Solis and Jesse & Joy in Concert at Toyota Center – Sing along to your favorite Latin tunes when iconic Mexican singer Marco Antonio Solis celebrates 40 years in the business with his tour, Y La Historia Continύa. Jesse & Joy will join him at Houston’s Toyota Center. Tickets start at $59.50. 8pm. Music That Should Be Danced at Miller Outdoor Theatre | FREE – Watch as the musicians and dancers of the Foundation for Modern Music collaborate in a vibrant performance that reflects our city’s rich, diverse, and creative spirit. This is a free ticketed event. 8pm. Brad Mehldau Trio in Concert at Cullen Performance Hall – Sit back for an impressive performance by pianist Brad Mehldau, alongside bassist Larry Grenadier and drummer Jeff Ballard, as part of Da Camera’s Jazz Series in Cullen Performance Hall at University of Houston.8pm. Things to Do on Saturday, April 14 and Sunday, April 15, 2018.